This article was originally published as part of a monograph titled, THE SIGNS OF THE TIMES, subset, Query Group III, Part 1, which was a response to questions submitted to Catholic Tradition in various e-mails. The numbers in brackets refer to the order of questions. (13) Why do people who seem evil become successful and powerful, and why does God permit them? (14) Why does it seem that I am a failure; I do my best to obey the Commandments and pray every day. (15) Why are my prayers not answered, why does God not give me what I have asked for? (16) I feel alienated from God, I think He has abandoned me, and I don't know what to do, prayer does not seem to help me. Help me! The problem of evil has always troubled good people who see evil for what it is, a hatred of God, in the heart of men and in their acts. They know men who have the outward appearance of being evil, either in what they advocate or what they do. When they put the name evil to others, they are declaring a distinction between themselves and these men who are also their neighbor as defined by Christ ----- that evildoers are a separate group of men. The puzzlement increases when men classified as evildoers reach the height of power, immersed in success and wealth. To some men who are striving to serve God and who may be impoverished or otherwise diminished in the eyes of the world and in their own eyes perhaps, this does not seem fair. One man asked me, "How come I obey the commandments and have so many troubles and setbacks, while it seems so many who oppose the teaching of Christ have good incomes and success in life? Why doesn't God do something?" He said he felt a failure. He was judging as the world judges. This has been the lament of men, since the beginning of the sons of Adam and Eve. The first resentment of success from one who claimed to serve God was that of Cain. He slew his brother Abel, whose sacrifice of the unblemished first fruits of his labor ----- a pure lamb ----- in atonement, was accepted by God Who received the sacrifice because it was offered by one who was pure of heart, so pure that he could not, would not withhold the finest offering. Cain seethed with jealously, the sin of spiritual envy. He had not done as his brother, instead, rendered to God not the finest of his labor ----- the best crops ----- but that which he could do without, second best. He did not find favor with God. Now the book of Genesis does not tell us why Cain chose an imperfect sacrifice, only that he did and what followed. His heart did not place God above all things, we presume. God held him to account for his brother and Cain knew instinctively, challenging God, saying, "Am I my brother's keeper?" We know that we are all our brother's keeper from what ensued. Cain was banished from other men and sent to roam as an outcast. Cain feared the retribution of his other brothers, of other men, and spoke of his fear to God. God placed a mark upon the head of Cain, that he might thus be singled out, not for vengeance, which is God's alone, but to let men know that Cain was not to be slain by them. Consider that God did not let Cain off easy, he was a "marked man" ----- the origin of the phrase ----- with all the harshness of life in disgrace, yet he was not to be killed for his crime against God. You answer, but this is not what I asked, Cain was not a success, he suffered. Yes, but the pure of heart suffered, too, he was slain by his own brother, not for what he did, but because of the jealously of his brother who did not offer up what is owed God. In other words, Abel was slain for the crime of his brother, while the brother who murdered him was not. The is the same sort of thing as your complaint. We all suffer but the good suffer more. Abel represents the unblemished priesthood, he is the figure or prototype of Christ, the Pure Victim on the Cross Who died for the crimes of those who put Him to death ----- all of us. This is the answer Christ gives from the Cross, our rightful response to the evil we perceive: Forgiveness. Forgiveness as we are forgiven our sins when we are sincerely sorry. God knows if we are truly contrite or not. We cannot read the hearts of men, so we are bound to forgive for the sake of our own souls and for the sake of forgiving. You mean we do nothing to punish evil? No, society was just beginning to bloom when Cain killed Abel, in violation of the natural law. God was still among men by acting as the instrument of justice ----- something we find over and over again in the Old or First Testament. It would not be until the time of Christ that God would walk among men in the flesh as an instrument of mercy. God banished Cain; men were to accept this as the justice demanded by God. Behold the mercy of God ----- He did not put Cain to death, when he most likely would have perished in the fires of Hell, because his heart was not turned to God; He banished him [there were no prisons or fines then] from society, and in doing so, He gave Cain a second chance as He did Adam before him, a chance to repent and do penance. This is what is meant by justice, tempered with mercy. We don't know the outcome, it has not been the will of God to reveal this to men through the Church, we will know the eternal place of Cain at the general judgment. Today society has a formal system of justice, be it good [recognizes the sovereignty and authority of God] or bad [no such recognition], it exists. Now let us turn to the New Testament. 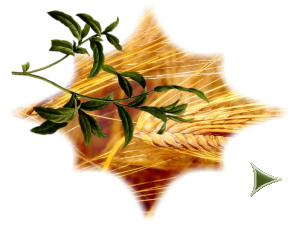 "THE PARABLE OF THE WHEAT AND TARES"
The kingdom of Heaven is likened to a man that sowed good seeds in his field. But while men were asleep, his enemy came and oversowed cockle among the wheat and went his way. And when the blade was sprung up, and had brought forth fruit, then appeared also the cockle. And the servants of the goodman of the house coming said to him: Sir, didst thou not sow good seed in thy field? whence then hath it cockle? And he said to them: An enemy hath done this. The good sower in the parable represents Christ, Who has His servants, the Angels of the Apocalypse ----- the reapers, who will gather the tares or cockles, which are unrepentant evildoers who are cast into Hell [bundles to burn]. The harvest is the salvation of the good, who were justified because they obeyed God and had perfect charity for Him and their neighbor. They are the wheat to be gathered in the barn ----- Heaven. I don't think I understand how this explains things. It is less the justice of God and more His mercy. God gives men free will. He does not go back on His word. The word that is pledged is also the Word, Christ. God chose 12 Apostles of varying degrees of goodness. Not good versus evil. One denied Him and was forgiven when he asked. Prior to this, another betrayed Him. God did not condemn Judas before men while he lived. He gave him every chance to repent as Peter would do soon. It was not until Judas hung himself that we hear Christ say of him: It would have been better that that man had not be born. Many theologians think Judas went to Hell based on this passage. The Church has not declared this a fact. The Church has the power from Christ to declare a Saint, but not to determine who is in Hell. No man is all good ----- only God is all Good ----- nor all bad, for God created man good, his existence itself is good, the splendor of God's creation is in man, the highest being in the Mother of God, full of grace, but good because man is created in the image and likeness of God. The image is Justice, the likeness, Mercy. No matter how wretched we may appear in our own eyes and those of others, we are not evil incarnate, we have goodness in us. The justice of God will demand every last farthing at our judgment; the first farthing or accounting parallels the first act of mercy on the Cross, the first word of the seven last words of the Word: "Father, forgive them, for they know not what they do." His prayer was infallible---it could not fail. Whatever little good man has done will be in his favor and his Guardian Angel will recount that good on his behalf, for mercy's sake. Whatever bad man has done, will be admitted by him, with the devil accusing him to himself, while he is making his account. The scales of Justice will be weighed [St. Michael's symbol is the Scales in some art]. If that man, no matter how many sins he committed, nor how heinous, if he, before death, was truly repentant, imperfect contrition in Confession or perfect contrition itself, the Scales will tip in his favor, meaning he died in the state of grace. This is what happened with the pronouncement of the Second word from the Cross, when the two thieves, both of whom were guilty, hung beside the Word made flesh, one on the left and one on the right. The thief on the left blasphemed, remained unrepentant; the thief on the right, "the good thief" knew that Jesus was innocent while he was guilty of the crime he was being crucified for. He asked Jesus to remember him when He entered His Kingdom. The man had true sorrow because he had offended God. Because he did so, the grace of God revealed to him Who it was that was crucified beside him. We know he was saved because Christ said, "This day thou shalt be with Me in Paradise." Two men who appeared to the world equally guilty died different deaths, that is, in disposition. We do not know if the good thief, who was so gentle of spirit prayed for the other's thief's final repentance in the last moment or not. It strikes me as something he would do just from the little we know of him, which is a great deal, because what we know is sufficient for a lifetime of meditation. Mary was there, beneath the three crosses. Did she not intervene also, this most merciful of Mothers, because the good thief would have asked? Even if he hadn't? From the moment of the giving of the third word, she was to Mother as the Mediatrix of all graces. Who could think other than yes? We don't know. Scripture does not tell us everything we would like to know. This is for us a mystery. Scripture does reveal what we need to know about repentance, does it not? How often in the Gospels? So many stories of the mercy of God and sinners who trust in His mercy and ask it on behalf of others. Always remember Judas's umbrage with Our Lord when He showered His approval on St. Mary Magdalen when she bathed His feet with precious ointment and dried them with her hair. Instead of rejoicing that a sinner was converted, Judas fretted about the cost of the oil. We all know Christ's answer. It has haunted the wicked ever since and refreshed as a balm, anointing the spirits of those who no longer want to be wicked. As the first Tribunal of Christ was from the Cross, so was the Tribunal of the Dispensation of Grace, His Holy Mother, who stood beneath the Cross. "Woman behold thy son, son behold thy Mother." This was the Third word of the Word on the Cross. All men save she, are guilty of sin, yet God in His mercy has bequeathed as His last will and testament His Holy Mother to the Church and she to the purest of heart of His 12 Apostles, St. John. Mothers love all their children, those who are very good and those who are not so good. The child who is in trouble is always the one the good mother showers her love on most, because he is in the greater need, the needs of the soul greater than those of other needs. Since all sinners are willed to Mary, Mediatrix of all graces, it is not up to us to say this person deserves this or not that, as if we are exempt. Recall the Parable of the Publican and the Pharisee. The Publican looked sinful to the eye of the Pharisee who thought himself more holy. Who was justified? The humble sinner, the tax collector, while the religious man, the Pharisee, who praised himself to God, no less, was not the hero of the story. This is what we do when we say, that man is evil or bad and he is rich, while I am good and I am poor. Who are we to say we are good? No Saint ever did, what ever good men found in them they attributed all to God. Rightly. A man may be very bad, but are we not also when we decide what we merit from God, that we are better than he is? Are we not evil to harbor such envy? Are we not of the world to judge so? We don't know whether the other man is humble when alone with God, but it is for certain, that if we think like this, we'd better examine our consciences because we have the appearance of not being humble at all. This was similar to the sin of the Puritans, besides that of heresy and schism. They held that the more success in life one had, the more one had favor with God. Our sin is to think it unfair to lack success while observing the commandments. Ah, we have only to look at the life of the Holy Family: they were modest and poor, known only to their little circle and a few neighbors. They had no money to go to the Temple for the Purification of Mary and the Presentation of Jesus. The mystic, St. Mary of Agreda, tells us that Simeon and Anna provided for their lodging in Jerusalem. Before this they were treated like peasants when they tried to find a room for the night, the holiest night of the year. Mary, the pure Mother of God, without blemish of any kind, had to give birth to the Son of God in a stable inhabited by animals. Think about this. Perfect Justice in the Providence of God. Perfect Justice because of the Fullness of Mercy. Jesus willed perfectly what the Father willed and this was the ordained will of God the Father. We are to imitate the Holy Family, not the successful innkeepers, who robbed themselves of the privilege and grace to adore the Newborn King. This is not to say that we must be deliberately poor, avoid being good at our vocation, if that vocation provides a decent income. No, it is the detachment we must have ----- from the goods of the earth. So detached that we not notice our neighbor's wealth in our hearts. This is why the fruit of the Third Joyful Mystery ----- the Nativity ----- is detachment from the things of the world. Physical poverty if need be. Spiritual poverty always. Spiritual riches ----- wealth beyond counting. Cain did not possess this virtue. True detachment enables us to be indifferent for ourselves. Not the indifference of sloth, the indifference to the circumstances that come, that being the will of God. It is not wealth that corrupts, it is the attachment and lust for it that does. Envy is another form of avarice. If we are detached it will matter not who is "good" and who is "bad" and who has what. The Fourth word from the Cross, "My God, My God, why hast Thou abandoned Me!" fulfills a prophecy of the Messiah; by uttering this lament Christ was saying in His agony I am He Who has come! He was also suffering in His human nature as the flesh suffers, only to the utmost, to the last drop of Blood. Thus He cried out. How can we abandon Him by refusing to ask for mercy for sinners; if we think another is worse than us and less deserving, is not this what we do, apart from judging? If we think another is less meritorious than we, are we not refusing him mercy? We are asking for mercy for ourselves in our supposed goodness [Pray, tell, why, if we are so good?] while remaining discontent and covetous of his situation as we perceive it in our minds. If we ask for mercy for ourselves who have some evil, is it not possible that another may have some good? Our Lady of Fatima asked us with urgency to pray for the conversion of sinners, those who have no one to pray for them. Perhaps that successful man is a horrid sinner; we can't know, but ought we not pray for the conversion of sinners, including him? Only after acknowledging our unworthiness before God to pray for the conversion of sinners, save the request of mercy by the Mother of all men. It is a privilege, not only a duty, to pray for sinners! As wretched we may be, so long as we are contrite and striving to do better, the sinner we spiritually adopt may be so wretched beyond his sins that he has no one but us to pray for him,. To carry our cross is not enough. Like Christ we must die upon it, too. And like Him, we must say, "Father forgive him, he knows what he does." Then might not Christ say to us, "This day thou hast found salvation." The Fifth word, "I thirst." is the cry of Justice and of Mercy. Blessed are they who thirst for Justice. Still more blessed are they who are Merciful. To look at a man's goods or reputation of greatness, and not see a man like ourselves, whom Christ thirsts for, He desires that He draw all men to Him, is to lack mercy. It is also unjust since we deny him what we owe to him because we are our brother's keeper. We may have to place a man in prison for the sake of natural justice, for the good of our neighbors, but we must be merciful. One of the seven corporal works of mercy is to visit the captives [those in prison]. Three of the spiritual works of mercy are to: instruct the ignorant, admonish the sinner, and bear wrongs patiently. To forgive persons rather than condemn. The Sixth word of the Word of God is "It is finished." His sacrifice is at a completion. The King of kings, the Son of God most High, the Second Person of the Trinity in human nature, stripped almost naked and hung on the Cross. Almost naked. It took this, and the last drop of His Precious Blood for the completion. We die, stripped naked too, our wealth, fame, position among the high and the mighty of no avail. He died naked ----- innocent, we die naked in guilt. If we call ourselves Christians, how can we say, this man is evil, he does not deserve his good fortune? If he is attached to that fortune, his death will be most fearsome. If he was not attached, perhaps this earned him enough grace to repent of his sins. Is this not what God wills? How can we not also will what He wills? His ways are not our ways, how can we judge by appearances? The Seventh word is "Into Thy hands, I commend My spirit." You know, St. Alphonse Liguori wrote many many beautiful prayers in which he poured out his heart to Our Lord and Mary. So many of those petitions include the admission that "if it were not for Thy mercy, or Thy grace, I would have merited Hell." A Saint who knew his sins deserved Hell! He had no wealth of his own, no earthly goods. Position yes, as Bishop and Head of a Religious Order, a position God willed for Him, and as with all Saints, a trial for him. He suffered greatly in this and had the ailment of crippling arthritis. Yet, he said he merited Hell. This was his spirit before God, one of commending himself because he trusted in the mercy and goodness of God. Ought not it be wise to follow such a Saint, as he followed Jesus, rather than judge circumstances as the world wants us to judge? Ought not we commend our spirits to God, in humble submission to His will for us, His perfect will? The Divine law is written in the heart of man, and we call this the natural law because it inheres in man's very nature, body and soul. But men do not have perfect knowledge of the effects of their actions unlike the Angels. God so loved His creatures that He was merciful and gave them another chance. Every time we commit evil, we receive the chance again and again in the tribunal of the Confessional. We are all evil, in that Christ told us to call no man good. By this He means we creatures are all sinners, save His Mother, who is unique in the economy of salvation or the order of grace. The smallest venial sin is such an evil, man does not have language enough, nor intellect enough to describe and grasp its enormity. If we could, we would die of fright. Again, the first tribunal of Christ was the Cross. After He expired, it being the custom of the soldiers who had the responsibility over the crucified, to break the legs of the condemned in order to hasten death, an act of mercy on their part, the only one they were allowed after vinegar and gall was administered to numb the mouth ----- the centurion, Longinus, came to the Cross of Christ. He was already dead, so he did not break His legs fulfilling a prophecy from the Old Testament. To be certain, however, Longinus took his lance and struck the Side of Jesus from which Blood and Water gushed forth as a fountain, the last farthing of the debt paid. As Wine and Water are blended together in the Chalice for the Consecration ----- the Mystery of Faith ----- by the Priest, for the many that are saved, so we ought to see in the blending of the wheat and the tares the mystery of life here. [The Council of Trent defines the translation as many, not all, because this portion of the form signifies the fruits, not the efficacy. Christ died that all might be redeemed, not all are saved. Let our Guardian Angels take us by the hand and lead us back to the field of the good sower. See, they show us, the economy of salvation is such that we must work out our salvation in fear and trembling as St. Paul instruct us. The golden field is marred by brambles. The answer to the question you have asked is there ----- midst the wheat and cockles. 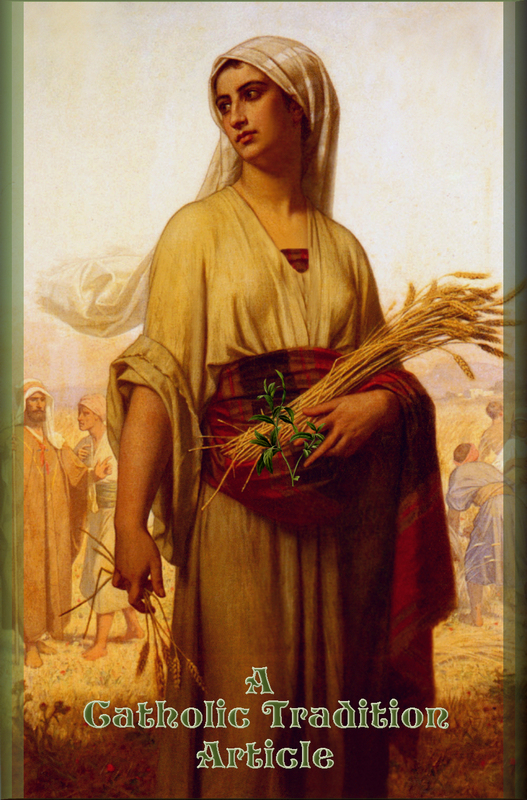 The wheat does not know it is wheat, it is content to be how God created it and the setting in which it is placed. It thrives among thistle. It does not judge the thistle, but grows upward and straight, gently bowing toward Heaven in the sun, to become the finest flour, daily bread. The tares or thistle knows it is cockle in its own way. It must wend its path wherever it can, to burrow deep and far, becoming a thicket of bitterness. It knows no glory, nor gold. It is despised. The truly good man does not think he is good, and the bad man knows he is bad, even if he pretends to the whole world differently. His shape is misspent, unruly. He is also bigger than his neighbor, the wheat; he has appropriated for himself more space, appears to flourish above and beyond. If only he knew how to make himself more comely, less loathsome to men. He looks at the wheat and sees how men love it. He is not merciful to the wheat, yet the wheat does not seem to mind, letting him have his way. How can this be? he asks himself. He knows he cannot be uprooted, for if he were the wheat would die, too. 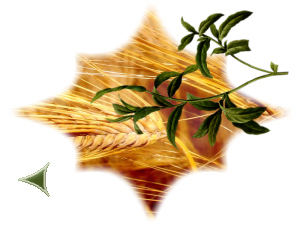 His existence is dependent on the wheat's survival, the wheat's worth and goodness, not his. The wheat is thus merciful, and grows more splendidly with each act of mercy. Because the wheat is limited in his opportunity, upward is his path, since the cares of the world, or the sideward and downward would choke him. That upwardness is justice itself because the wheat conforms to his nature as created, he is just as he is supposed to be, all and only that which is owed to him is provided. There is no more more. All the cockles proclaim: Ought not this be unjust? Mr. Tare cannot penetrate this mystery. The sower seems content, the arrangement is just to him. It is enough. Providence and confidence in that providence. This, then is the answer to the mystery of life, why does it seem as if the good suffer and the bad prosper? The good suffer as Christ suffered, for the sins of all, to proclaim mercy to those who show no mercy. If the bad man who is not all bad merits damnation, the little good he did on earth must be rewarded. His prosperity is the reward. If the bad man who prospers merits Heaven, his goods were for the good of others, although unseen except by God, in some way conforming to God's plan. If the good man rebels against the Divine plan, loses confidence in that providence, he loses what little good he has, unless he repents. There is another Parable, that of the stewards, one who wasted the little he had been given to oversee and lost it all. To judge by external things is to take on the spirit of the world, while to be content to submit our spirit to the Justice and Mercy of Divine Providence, is to renounce the world. Why does it seem that I am a failure; I do my best to obey the Commandments and pray every day? You are looking at this backwards. Prayer is for union with God first, supplication for favors, second. Yes, we are to ask for what we need although God already knows. Why? Because He has preordained that we should participate in His loving goodness, His Providence, by asking. It is how He has chosen to provide. God provides everyone with enough grace to be saved. Despite the claims of the Declaration of Independence, He does not create all men equal. This ought to be evident from common experience. He loves some men more than others, favored some Saints more than others. The Saints are Saints because they did not complain, they rejoiced in the goodness and gifts of others, precisely because they did not think of themselves better than others, but worse. God also does not send trials that are too much for us, even if we think that this is the case. He is all good and always wills what is best for us. The Catholic has a Declaration of Dependence, by grace alone, the grace of God. As long as we do our best to use the grace we are granted, this is success. It is the good that God wills. The only failure is to be in Hell. There should be no one there, but Hell is filled with failures. Now, when some people ask about failure, what they want to know is: How come God did not answer my prayer to succeed in life? There are no easy answers that will fit every one's situation. We cannot know the mind of God. Our Faith infallibly instructs us that God desires our salvation; to this end He will chastise as need be, always a good sign, for the greatest Saints received some form of chastisement, either for their own advancement or knowledge or to suffer for others; other times He prevents the request because it is bad for us, although we cannot understand this. There is an old adage, "Don't pray too hard for what you want, you may get it." Meaning, sometimes what we ask for appears perfectly reasonable to us, but it is not so, too late we realize. This too, is a good sign, for God is protecting us. Men of iniquity who still ask God for favors, through others, often, may receive these benefits for the reward of the little good they may have done, the natural good. Whatever the reason, how can we judge God to be unfair? We cannot. Either we ask Him to give us the grace to trust Him or we refuse to do so and live in bitterness, far from Him. There is a third reason, to keep us humble. The hold that the effects of Original Sin have on us are so strong that we are easily filled with pride when we see the good things we accomplish. So full of pride there is little if any room for God. It is only at our judgment we will know the good we accomplished. If we see failure, we either strive harder, or fall back, it is up to us, we have only to trust in God. Our works are not ours, but His. Saint Catherine of Siena, a Doctor of the Church and mystic, was one who considered herself an absolute failure. She accepted her state and trusted in God. She did not know that she was a success while she lived. She grew in humility, not dejection. You see, she felt that God was calling her to to go to Avignon, France, during the residence of the Popes there when there were more than one claimant to the title and office, off and on. It was a time of upheaval in Europe and in the Church. She pleaded with the rightful Pontiff to return to Rome, to the seat of Tradition. He did go back but not when she requested. She died thinking she had failed God. It is so much more painful to think we have failed God than ourselves or someone in our family. Failure is hard for anyone because we are taught to do our best to accomplish great things for God and sometimes this means for our country, too. Unfortunately men take the measure of success from the wrong play book, that of the world. We have to look beyond, toward Heaven, and there plight all our troth. We don't know why God let Catherine see failure, but whatever the reason it has to be perfectly just, perfectly merciful, perfectly good. If God let St. Catherine, who was privileged with a Mystical Marriage to Christ, endure a sense of failure, cannot we also, and more deservedly? Sometimes God lets us see a little success in order to not completely discourage us, like the good parent who is admonished in the Catechism from being unduly harsh in correcting a child. Every child is unique and what may be unduly harsh to another may be just right for another. We pick our way carefully through the brambles in life, we are not perfect at it. God is perfect. Therefore, let me repeat, Hell is full of failures. The only failure that matters is to lose our eternal happiness in Heaven with Him. Why are my prayers not answered, why does God not give me what I have asked for? God answers all prayers except the prayers of those who have abandoned all hope, committing the sin against the Holy Ghost which is not forgiven, the refusal to ask for salvation, to ask for mercy. Usually this person does not pray at all, but in principle if he should, remaining in this deliberate state, his prayers would not be answered. This is from the Council of Trent. Usually when someone says, "My prayers were not answered," they mean I did not receive what I asked for in the way I asked for it. God is not a rich, doting uncle or Santa Claus, hand Him my wish list and it all comes true. God is a loving Father. No father, who truly loves his child would give that child everything he asked for or desired, even if he could afford it. This is because a wise father knows that he must instruct his children to be humble, chaste, obedient, to have fortitude, prudence, and a spirit of detachment. When a child is small his needs are simple, and he is content with little as long as he has what is necessary, above all love, patient love. As he grows older he learns that the world is bigger than his father's arms. He explores, and naturally given to curiosity ----- which is the spark of learning ----- he may discover more than is good for his nature and his manhood. He begins to ask for many things. His father says no to the things that are capricious, dangerous, inopportune, etc. He must, if the child is to develop into a man who desires sanctity above all else. The child thinks what he wants, and all that he wants is good for him because he knows it exists and he desires it. He does not have the judgment of his father who had the benefit of his father's judgment before him. Depending on his temperament and the amount of grace he has merited, he can accept the denial or whine or continue to ask his father. He knows his father will say no, but he can't give up the trying anyway. This is scenario 1. Scenario 2 is when the son asks for something that is good for him, but he is too young. The father tells him he will have to wait until he can earn it for himself, or he is old enough and so on. After a time the father is busy with chores; the son has saved some money and grown a bit; he asks again. The father says yes. Sometimes it may take a few tries, but the father keeps his word and grants his son his request. Scenario 3 is when the son wants a new car; the boy had an old jalopy that he wrecked because he did not observe the speed limit. Then he borrowed his older brother's car and damaged that, too. The father has to discipline the boy in some manner. He denies the car, not only because he is concerned about his maturity, but because he does not merit one. He did not offer to pay to fix his brother's car, in fact. This is how it is with God, our loving, perfect Father. He knows what is good for us and what will harm us; we may not know because we are not all-knowing and all-wise. If we needed the prayer to be answered as we expected to save our souls, it would be granted. Not so with health, and other earthly goods. And sometimes God is chastising us to get our attention. He may be asking us to forego a good thing in order to suffer for the sins of others if not our own. When it is the latter, the person is not disappointed; he says, I accept Thy will, O great God, because Thou art all Good and Loving. Thy will be done on earth as it is in Heaven. I will offer up this little denial for the conversion of sinners. A person who would question God's decision would not be given the grace at that time to see what it is that God was asking of him. I feel alienated from God, I think He has abandoned me, and I don't know what to do, prayer does not seem to help me. Help me! God only abandons us if we have committed the sin against the Holy Ghost, refuse His help, refuse to repent, the sin of final impenitence. He will not help us without our cooperation. He keeps His word, it is up to us to choose. But I don't think this is what you mean. Most people mean, I have no consolation from prayer and nothing seems to get better. You feel like God has grown distant or you have and have become desolate. You still have some faith left. How do I know? Because you are trying to understand, you haven't given up, you reached out for help ----- "Help me!" This is to the good and a sign of hope. If you were on your way to the unforgivable sin you would not have reached out. Judas did not reach out to anyone except the Jews whom he received his thirty pieces of silver. He tried to have them take it back, they refused and he threw the pieces down and left in despair. He wanted them to somehow make things right, to take back their perfidy against Christ. He was asking a kind of anointing or forgiveness from those who had no power or notion of mercy. Christ awaited him in gentleness. When Jesus arose from His prayer in the Garden the throng of soldiers advanced with Judas in the lead, who went up to Him and kissed Him. Jesus said, "Does thou betray Me with a kiss?" If Judas, had asked forgiveness it would have been granted in the instant. Because he let his sins, the enormity of his crimes, theft and the plot to kill Jesus, Who was innocent, take priority over humility he had a false pride, pride in that while he was not proud of what he did, he thought his sins were too big to obtain mercy. What an insult to Christ. So he committed the unpardonable sin in his own mind and desolation covered him. He killed himself in an act of despair. Utter folly. No, this is not your trouble here. Generally aridity and desolation in prayer or after prayer comes from two spiritual things. The first is the desolation, even abandonment, that Saints felt, called the "Dark Night of the Soul". St. Teresa of Avila experienced this. For years she struggled with just the Rosary. She wasn't being tepid, God was trying her, purifying her for Himself. At one time when she was young she had been lax. This may have been a chastisement, not to punish, but to heal, to perfect. If He had given her too much consolation she would have become inordinately attached to this and not progressed. Beginners of the spiritual life will find sweetness and solace in prayer for a time, then it seems it disappears. Sometimes it is because we deserve it because we have let the spirit of the world intrude far too much; other times it is to promote advancement. All the Saints suffered to pray from time to time. So much so that one, I can't recall who, but I remember the utterance: "God if You will me to, I will go to Hell." He did not want to go to Hell and God does not want anyone to go there either. What he meant was he felt so abandoned and unworthy of God, though he loved Him and wanted to do His will, he would obey a command to go to Hell, thinking he deserved it. God cannot command anyone to go to Hell because this is not Who God is in His operations. It is the sinner who prefers himself to God who sends himself there. I also know this is not your state, because you want God, seek union with Him above everything. You are struggling to understand. Pour out your heart about this to Him. Then wait upon Him in His "time" not yours. Make your desolation a prayer itself. Tell Him you will do whatever He requires. And wait. Pray as best you can, don't worry about each particular. This is easier said than done because we human creatures judge by our nature, in our nature, not as God judges. This is okay, actually. All any of us have to do is to trust Him, and distrust ourselves, the first rule of spiritual combat. Trust Him when He seems absent ----- He isn't, we think so, but He isn't. It is easy to love someone when he is always there, pays attention to you, it is much harder when his absence is inexplicable, frustrating, even frightening. This is the same with God. Human beings can let us down, often do, as we do them. God will not. He loves to be trusted as much as He loves to be asked for mercy, for graces. Pray for the grace of trust, then trust in that prayer and wait. He is perfecting you even now. Slowly, surely. 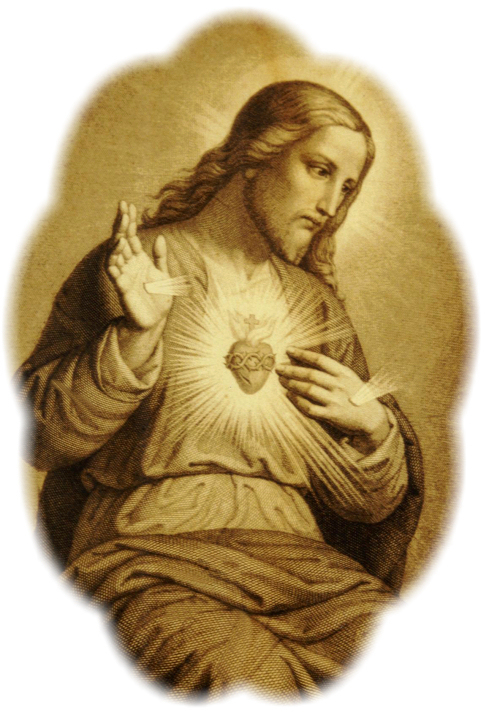 Thee, O Sacred Heart of Jesus. 1. The Litany of the Sacred Heart calls Jesus the Vessel of Justice and His Mother in the Litany of Loreto, the Mirror of Justice. A mirror reflects one's image. The response to the first is "have mercy" and to the second, "pray for us". The Catechism of the Council of Trent teaches that when man forgives injuries he takes on the likeness of God, "Who maketh His sun to shine on the good and the bad, and raineth upon the just and the unjust." [St. Matthew 5:45] Taken from the section on the Commandments, p. 428.